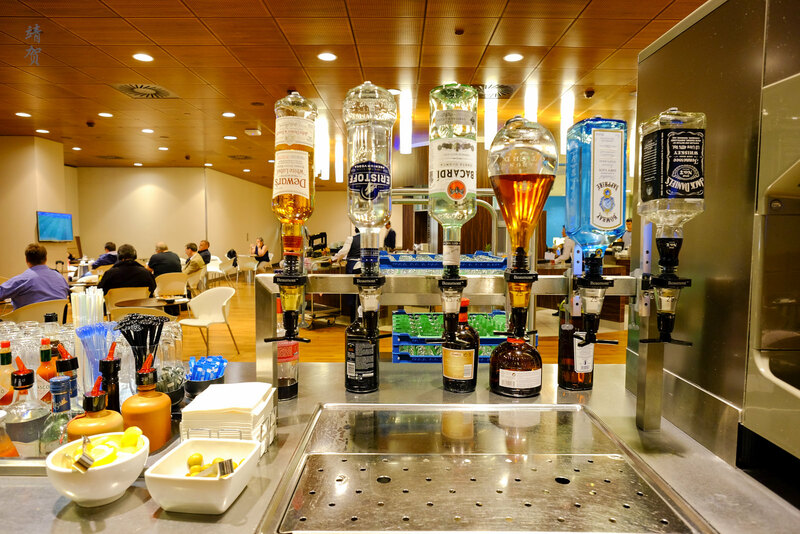 After disembarking from my flight, I proceeded to KLM’s Crown Lounge near gate 25. When I arrived, it was just in time to see England concede a goal in the Tunisia match. 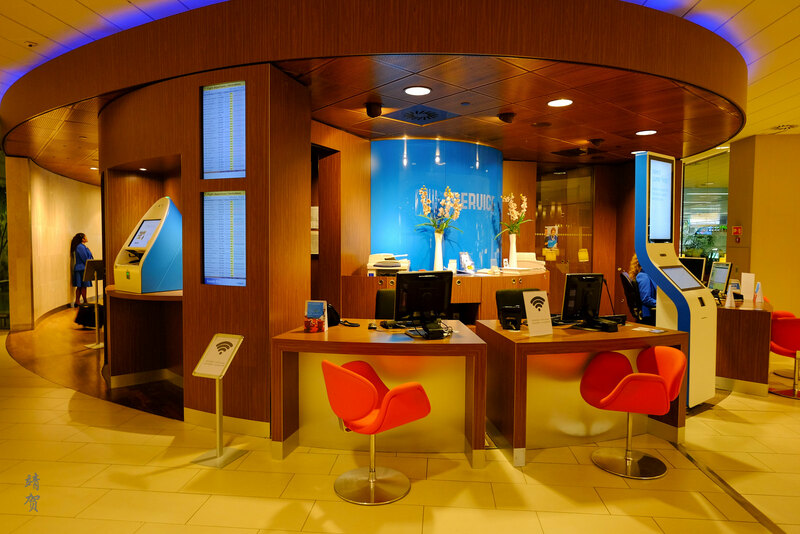 To get access into the Crown Lounge, passengers simply have to place their boarding pass above the scanners but there was plenty of staff to assist if required. 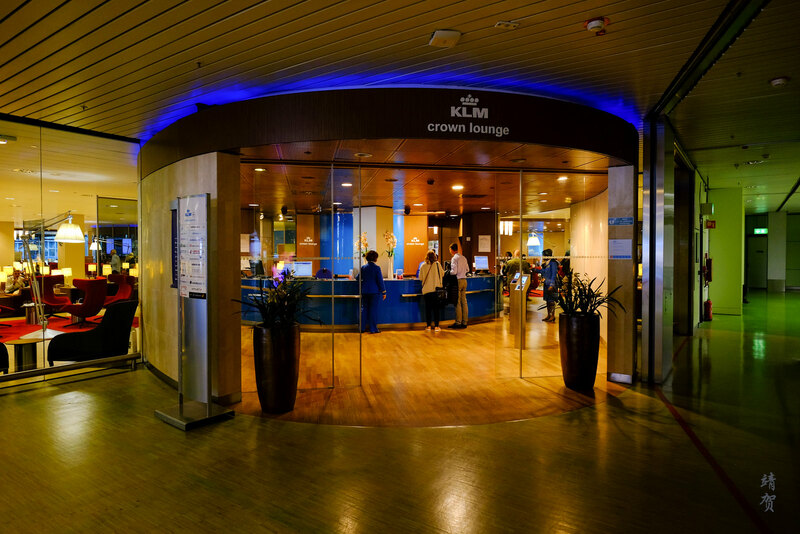 A service desk around the back of the circular reception area provided keys to the shower rooms, along with any other inquiries guests would have regarding their flight. At my count, there was around 4 private shower rooms located beside the Business Corner in the lounge. There was no wait for me to use one of them and the interior of the private shower rooms was bright and modern. 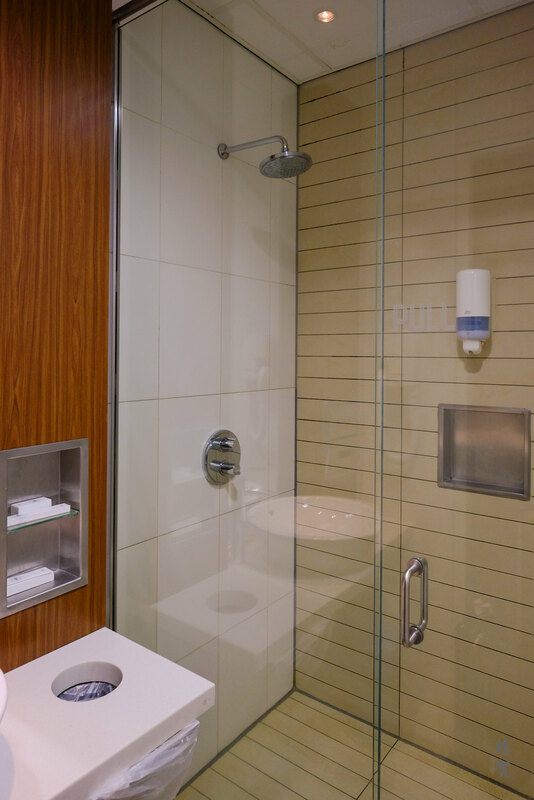 Aside from the countertop, there was a shower area with a rain-shower but no handheld shower head. 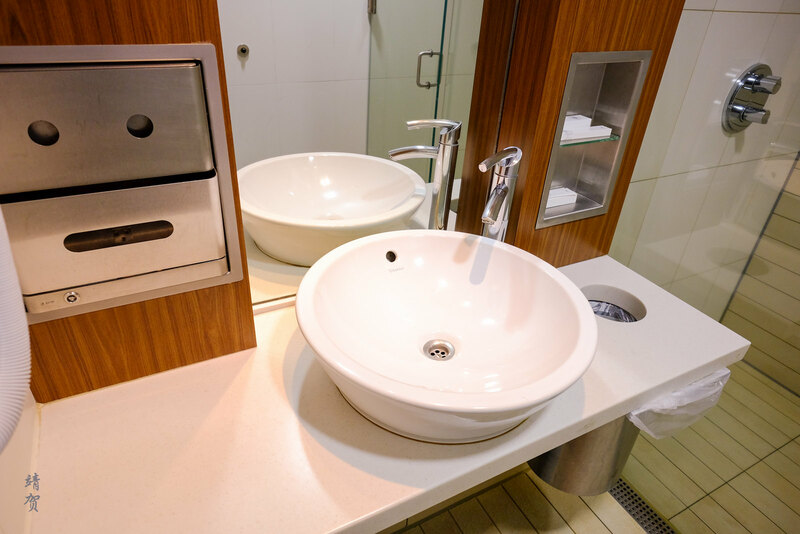 A multi-purpose shampoo was placed on the wall mounted dispenser and there was a shelf for personal toiletries. There was no private toilet here though. 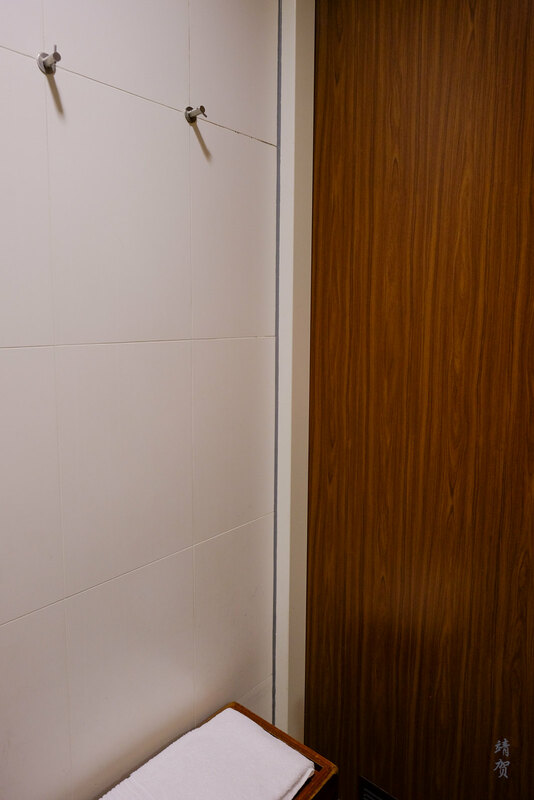 While the shower area was small, it was functional with hangers by the door. 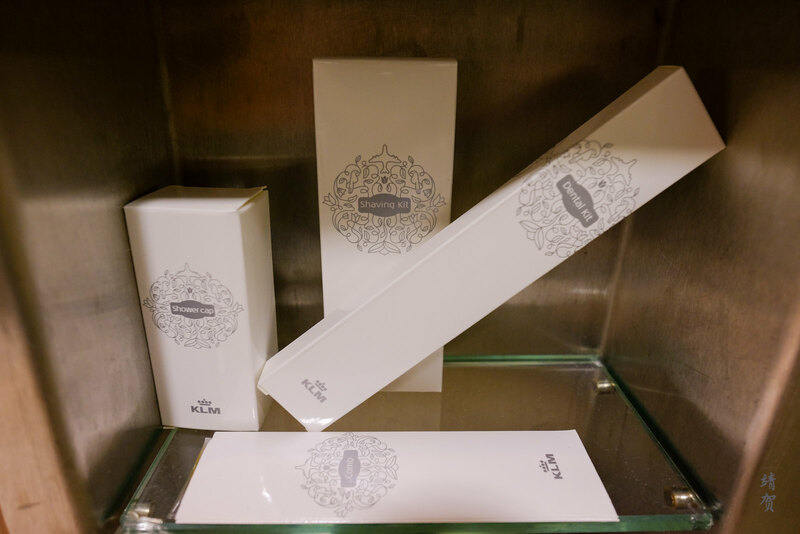 Amenities like a dental kit, shaving kit, shower cap and comb can be found on the shelf by the sink. 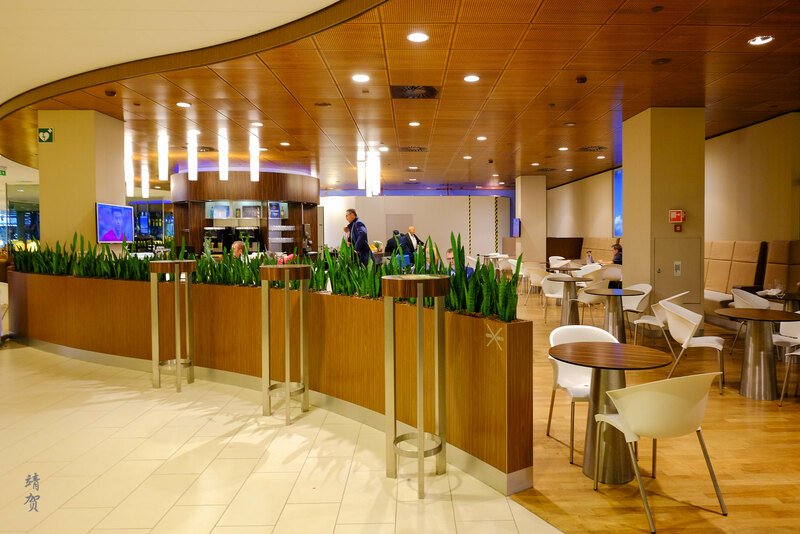 For a large lounge the public bathroom was packed with some of the urinals and sinks out of service, so they could be facing plenty of use and certainly need tp step up their maintenance. 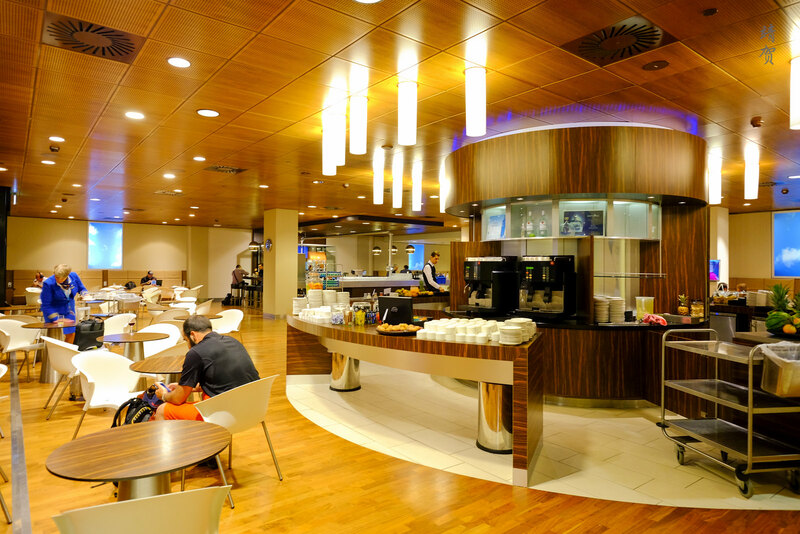 Inside the lounge, there were two separate sections, each with their own circular buffet counters. The first section is easily visible with windows overlooking the main terminal while the other section is located on the right side of the entrance. 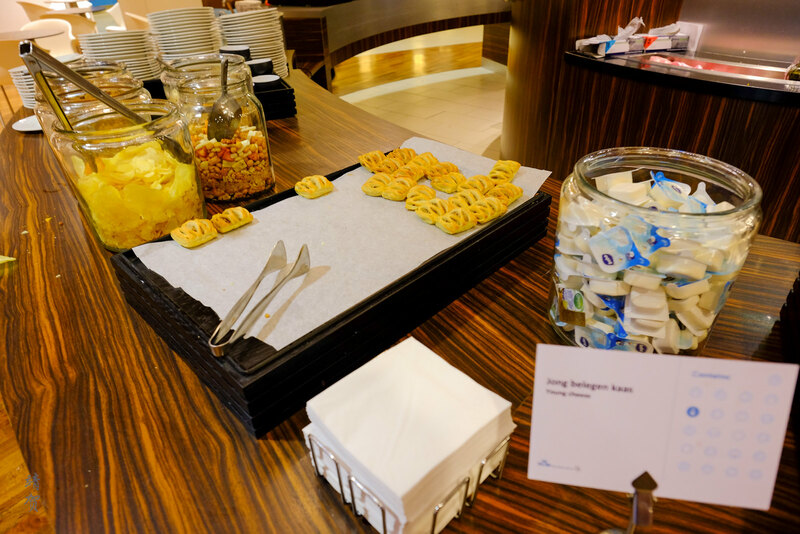 The dining areas beside the buffet area are furnished with plastic white chairs and veneered tables, giving it the feel of a cafeteria especially with the open trays where guests could place dirty utensils at. 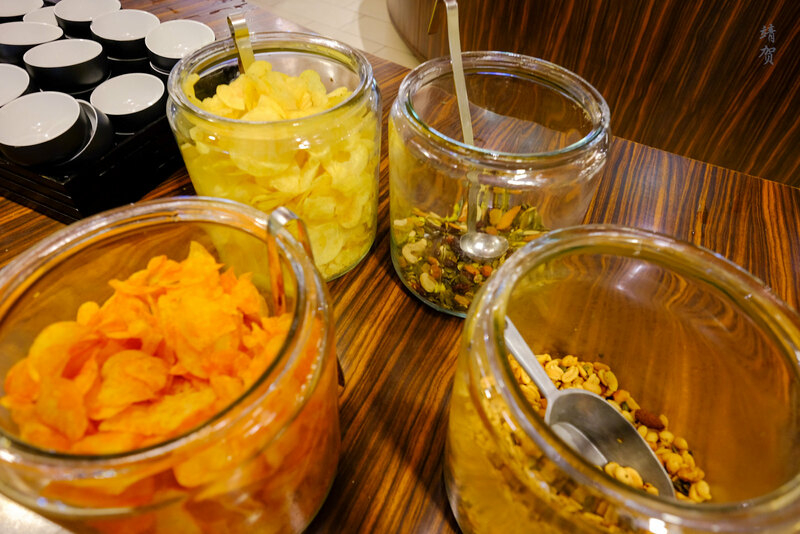 Buffet in the front has simple snacks like chips and nuts in large jars with scoops to get them out. 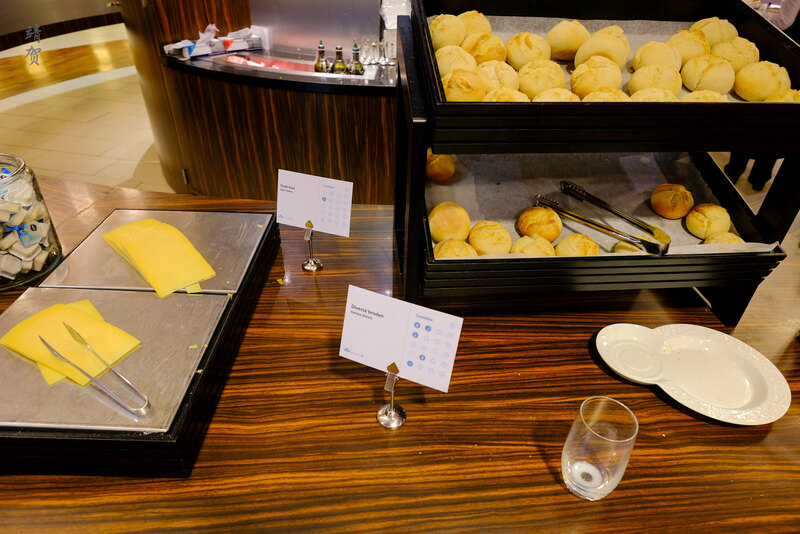 Beside the snacks, there was a tray with sweet pastries and a tiered tray for buns and sliced commercial cheese. Next to the bread was a soup pot with 2 kinds of soup and the choice that day was between Italian tomato or curry soup. Toppings of croutons, green onions and beansprouts were prepared beside the soup pot. 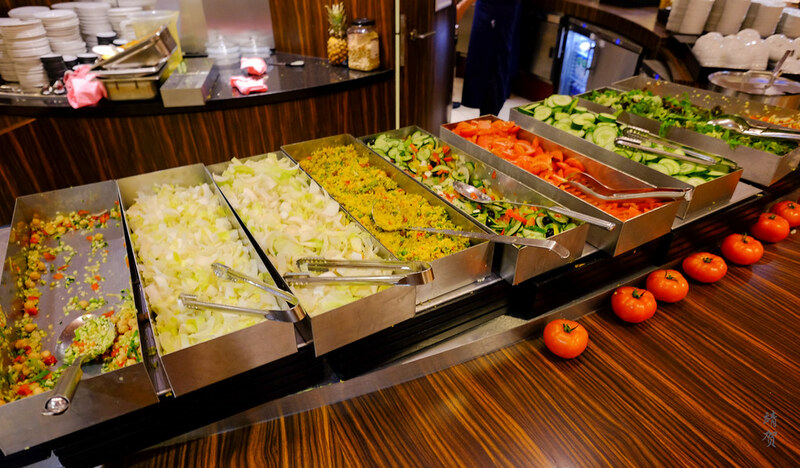 The main section in the buffet was dedicated to the salad bar where there was pasta salads, sliced vegetables, tomatoes and onions. 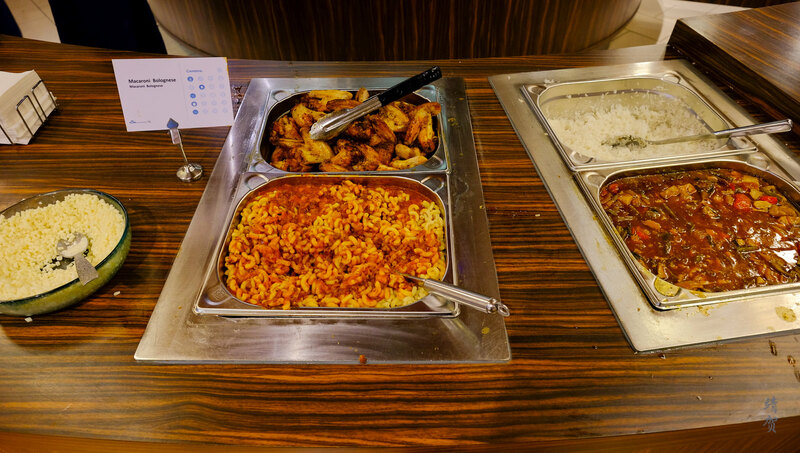 There was hot dishes like macaroni bolognese, chicken wings, some sort of stew and rice to choose from as the main dish. 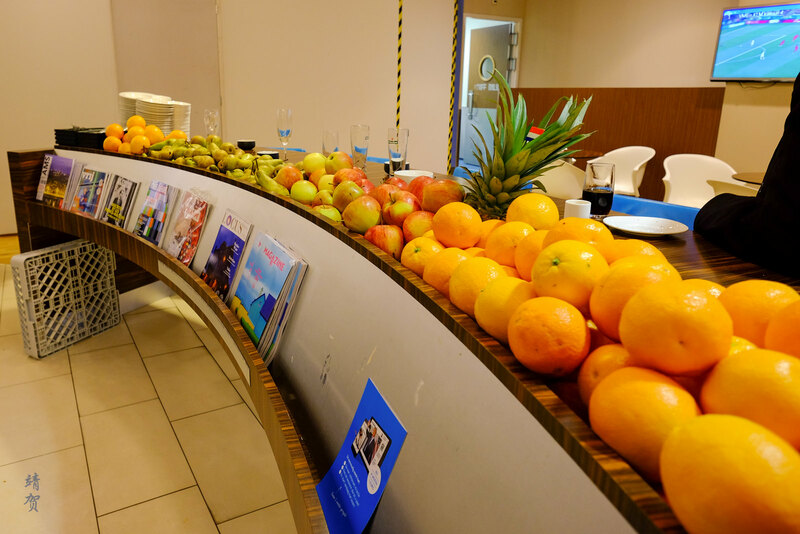 Fresh fruits were available on the buffet counter and some parts of the buffet doubles as a magazine shelf so guests could grab something to read along with their food. 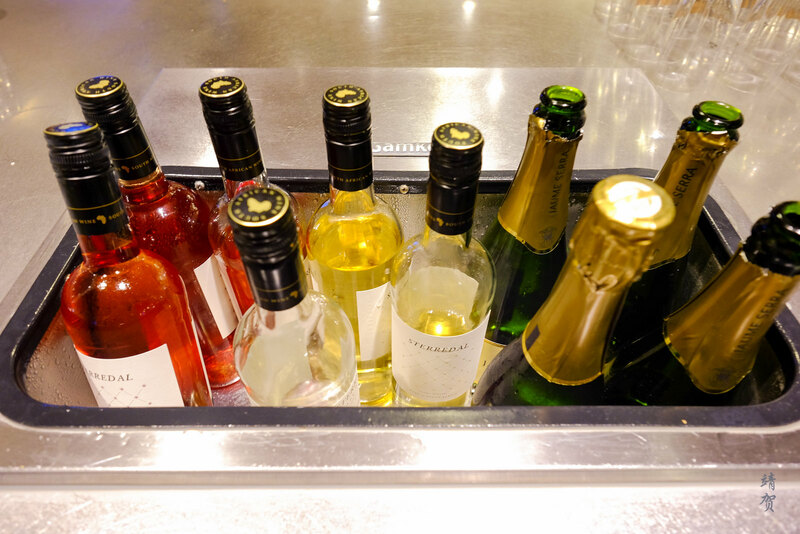 For beverages, guests could choose from a selection of wines and liquors from the bar. All of these are self-service. 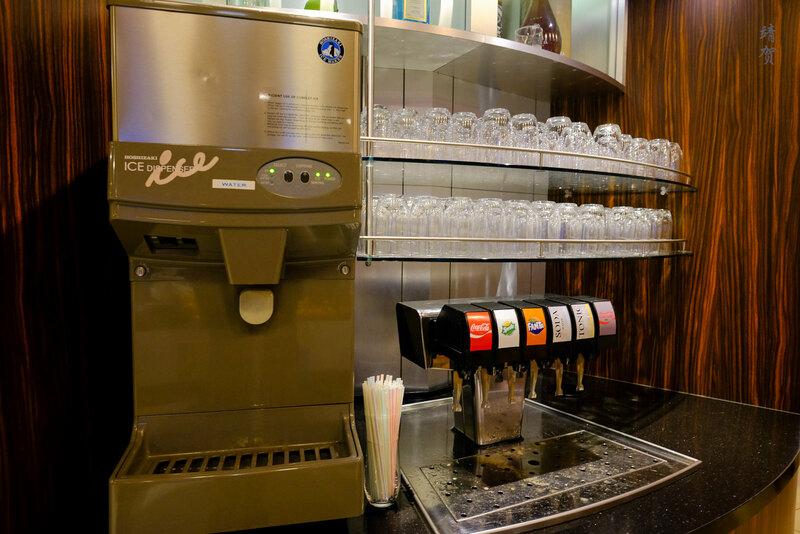 There was a soda dispenser, espresso machine and tea bags from Pickwick to choose from as well. 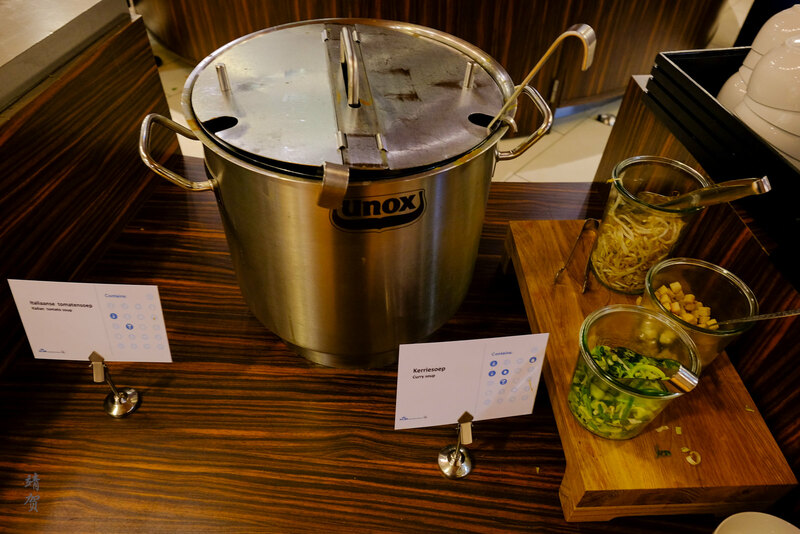 Other drinks like juices and milk was available in jugs from the buffet. 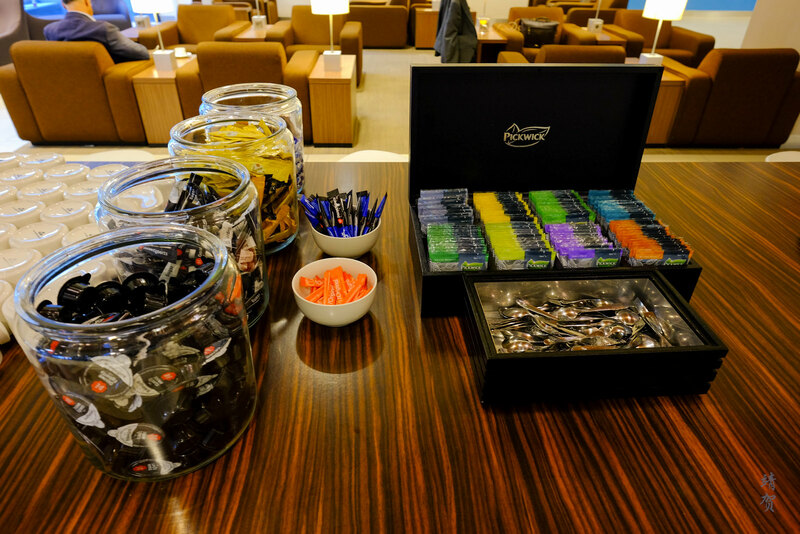 Aside from the buffet areas, coffee machines and tea bags was located in the end of tall bar tables within the lounge area. While I never saw the dining areas to be busy during my short visit, there was additional standing tables on the corridors for guests who cannot find a seating space. The variety of seating in the dining space was nice to make it versatile for all kinds of guests. 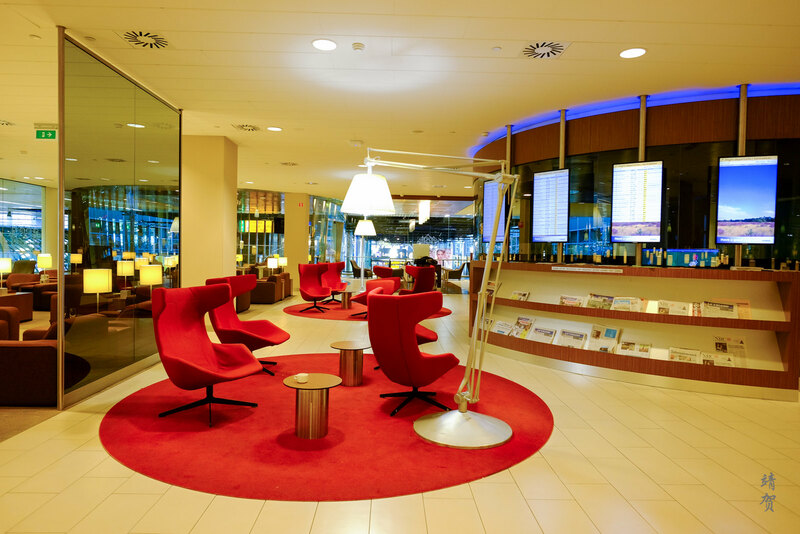 In the centre of the lounge, there was an enclosed TV lounge within a circular space. As it was the one that has the most guests due to the World Cup and the fact it was not brightly lit, I did not take a photo of this space. Surrounding this circular space was magazine and newspaper shelves with departure information boards. Comfortable armchairs can be found around this area though the lack of partition here makes it very open. 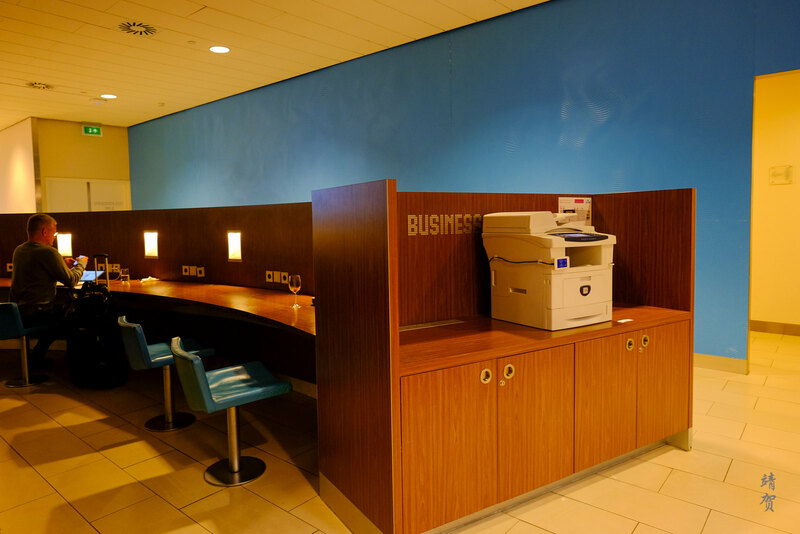 Around the space, guests could also find the business corner with tables that has convenient power outlets and printers at the end if they need to print some documents. 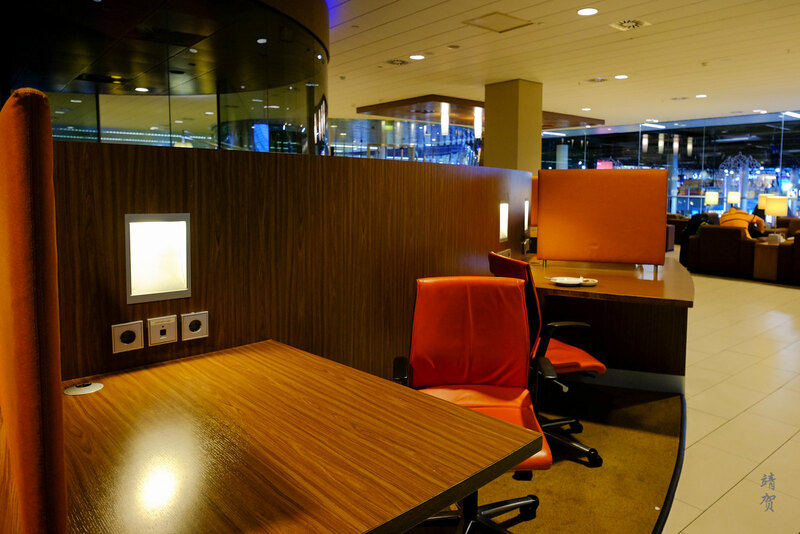 At the other end of the lounge, there was several working cubicle that provides more privacy for guests needing more space. The swivelling chair here makes it more like a mini office for guests. There was another circular room within the lounge that has its own door as this was the designated smoking room for passengers who need to puff that cigarette. There was times posted on the door when the room would be regularly cleaned for the benefit of guests using it. 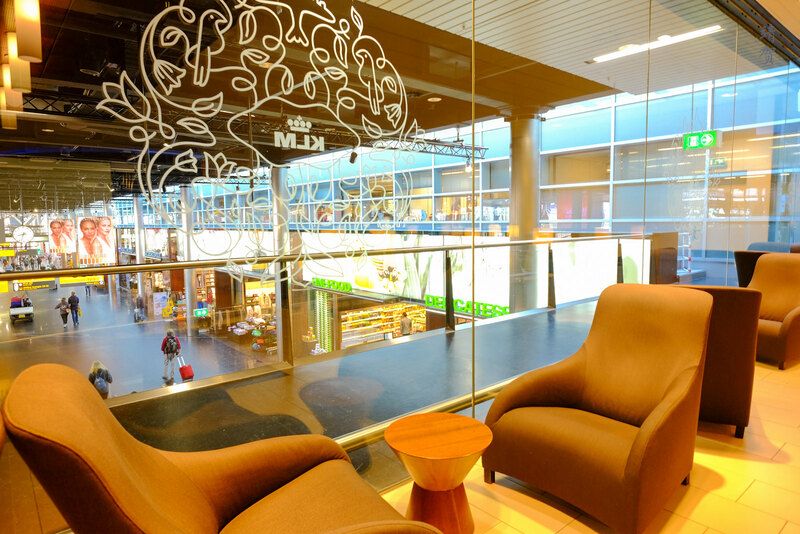 Leisure travellers would perhaps enjoy a seat by the windows that have a view of the terminal. 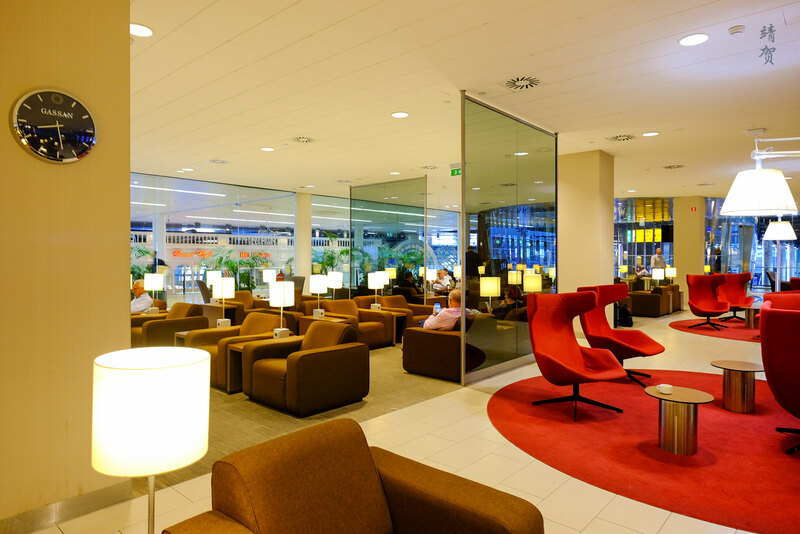 With the glass windows opening out to the terminal this lounge has an open concept which does mean less privacy for most guests. 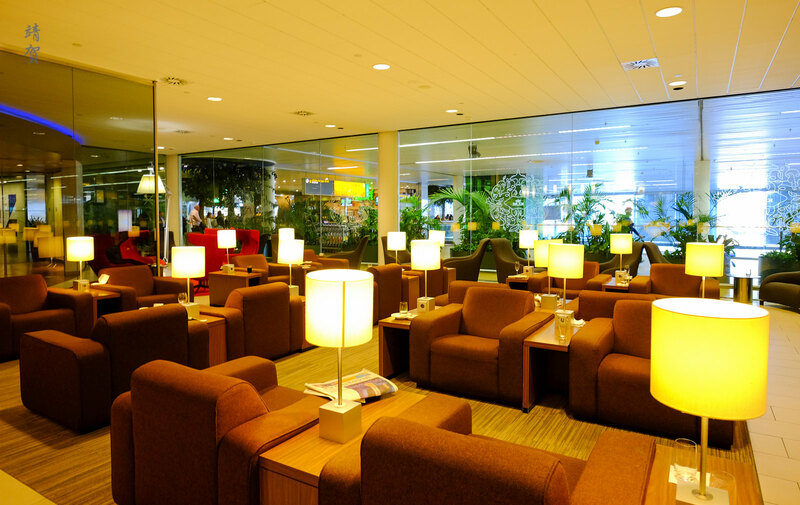 In fact the seating here seems nearly similar to the one found in the Silver Kris Lounge in Changi Airport. That means plenty of seats in an open space. 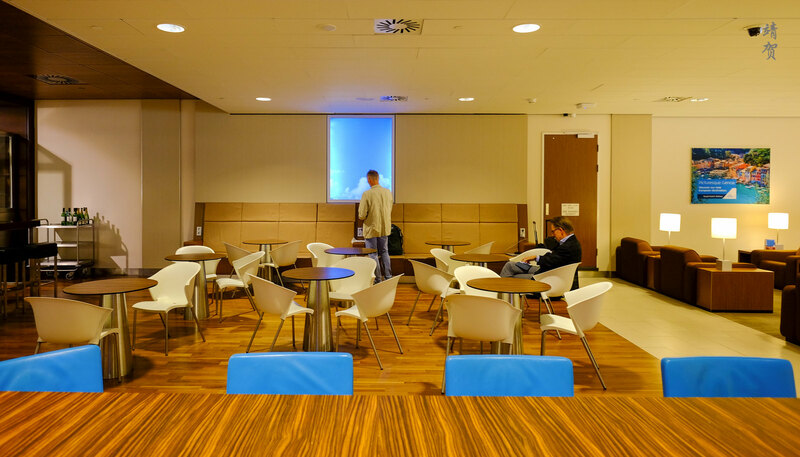 In summary, this was a very large lounge that caters to KLM’s passengers in its largest hub airport. 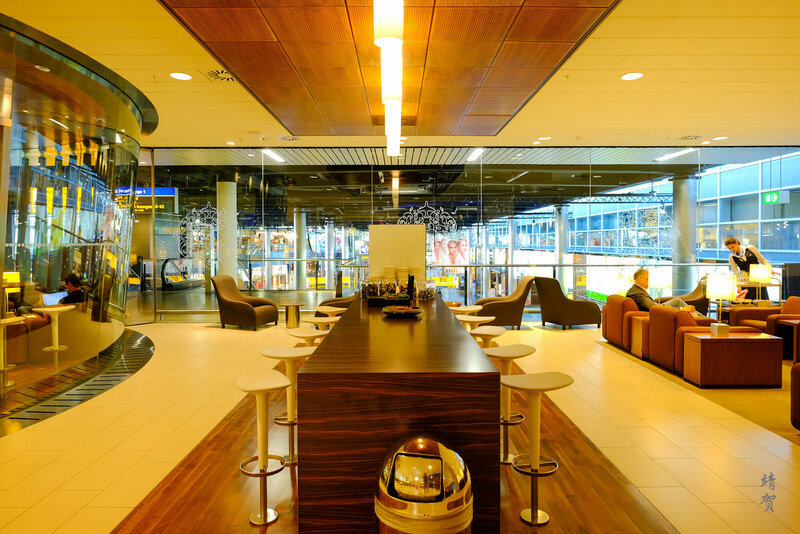 Thus the space is not exceedingly large considering the number of flights the airline operates out of Schiphol. 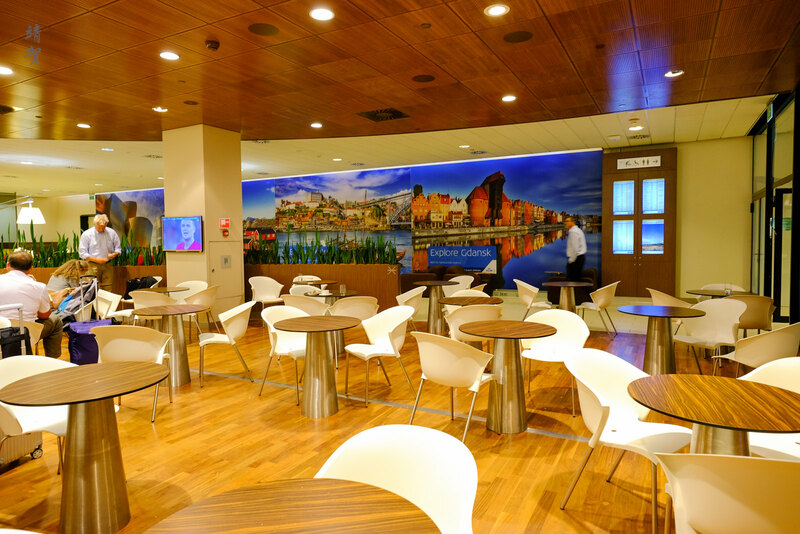 This lounge has all the basic facilities and several configurations of seating with free wifi and various separate areas to watch TV, have a smoke, sit down for a light bite, read some magazines, do some work or even have a shower. And with that, it accomplishes most of the stuff that a traveller might do on their transit time. 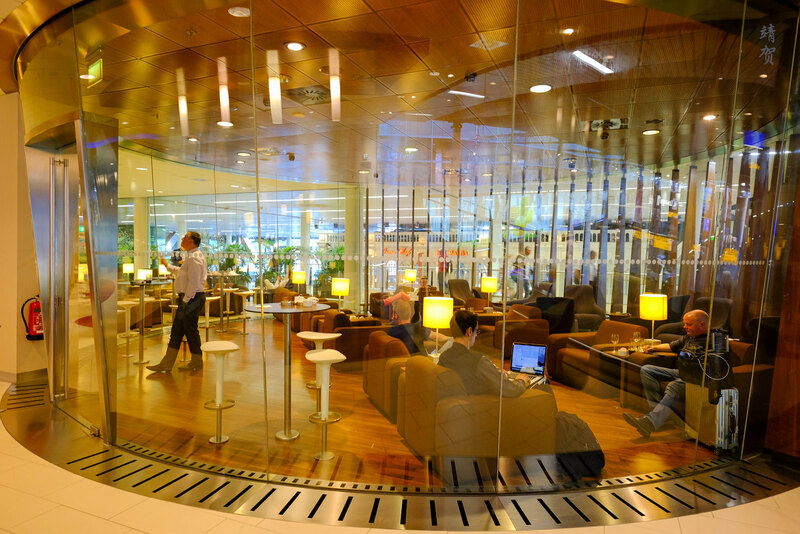 @Glretief, the lounge is indeed crowded and the food selection was not great but I found there was still enough space to rest and relax for the transit.